When you hear “bat”, what do you think of? A small, hairy creature that is active in the darkest hours of the night and who sleeps upside down? (That’s what I think of!) And it’s true! But there is so much more to bats than that. Did you know that bats are the second largest order of mammals in the word? In fact, there are more than 1,300 bat species worldwide and they represent about 20% of all classified mammal species! And, they play a huge, often underappreciated role in ecosystems across the globe. Humans may have a lot to learn from these nighttime predators as they are critical to pollination, reforestation, and even pest control. First, a little background. Bats are categorized into two groups. The first are the fruit-eating megabats (also known as flying foxes). This group makes up 30% of bat species, and, as their name suggests, they consume various types of fruit. The second group is the echolocating microbats, which makes up the other 70% of bat species. The bats in this group use echolocation, a sort of night vision to hunt and consume small insects. Not only do bats make up a huge chunk of mammals, but they are found worldwide. 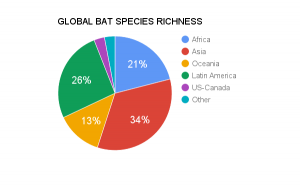 34% of all bat species are found in Asia, 26% in Latin America, 21% in Africa, 13% in Oceania, and 6% in the US/Canada and other regions. While often overlooked, bats are key to the ongoing success of many ecosystems–both as pollinators and predators working to keep insect populations under control. The warm weather and constant availability of fruit in the Tropics makes it a paradise for fruit-eating bats who live there in abundance. However, insectivorous bats, vampire bats, and nectar-feeding bats are also very common in the rich, warm, biodiverse ecosystems of this region. Fruit bats vary in size, from around two inches in length up to a whopping 16 inches with a wingspan of over five feet at their largest! The tiniest bats weigh a few ounces while the biggest ones can even weigh a few pounds. Additionally, fruit-eating bats have very large eyes and excellent vision, so they depend mostly on sight and their sophisticated sense of smell for daily activities such as foraging for fruit. Non-fruit-eating bats, or the echolocating microbats eat mostly insects. Insectivores and other carnivorous bats lack the superior eyesight of the fruit-eating bats and rely on echolocation to find and consume their prey. Surprisingly, this lack of eyesight is not at all a disadvantage for these bats. In fact, a single echolocating bat can consume over 3,000 insects in one night! Nectar-feeding bats are important pollinators of tropical rainforest plants. Like fruit-eating bats, nectar-feeding bats rely on sight to locate their primary source of food: flower nectar. To gain access into those hard-to-reach flowers, these bats are equipped with a long, thin tongue, like that of a hummingbird! As they rub up against the flowers to reach the prized nectar, they become vital pollinators for the rainforest. Vampire bats have a reputation as the scary creatures from horror films, but in reality they feed on farm animals in tropical regions. They use their chisel-like incisor teeth to make a tiny incision in the animal’s skin in the darkest hours of the night to avoid predators. Why are Bats Important as Pollinators? Bats pollinate many ecologically and economically important plants around the world. In fact, there are at least 500 species of flowers that rely on bats as their pollinators. While more common pollinators like butterflies and birds are general pollinators (meaning they collect pollen from many different plants), bats have specific preferences when it comes to which flowers they pollinate. Many of these unique flowers have even evolved to attract bats as opposed to other, general pollinators. Some of these adaptations include always being open at night (ready for pollination and closed during the day), large in size, pale in color, and very fragrant with a fermenting or fruit-like odor. Often times, the flowers offer a copious amount of dilute nectar to attract the bats. 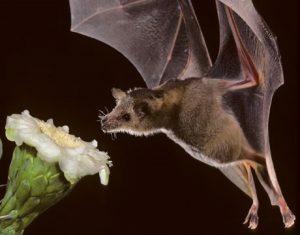 In addition to the beautiful flowers, bats do great favors in pollinating other plants. In Australia, flying foxes, nectar, and fruit eating mega bats, pollinate the dry eucalyptus forests that produce timber and oil for human use. 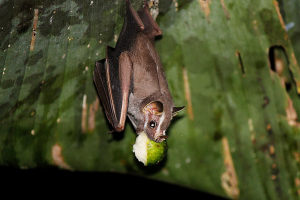 Mexican agave plants, a source of fiber and a key ingredient for tequila, are additionally dependent on the pollination services of several types of nectar-feeding bats. Thanks to bats, we have a variety of excellent resources. Not only do bats love eating fruit, but they are also crucial in providing humans with a variety of fruits. Mangoes, bananas, guavas, and peaches are just a few of these delicious fruits that are predominantly pollinated by bats. Deforestation of the Tropics is a huge, worldwide issue. 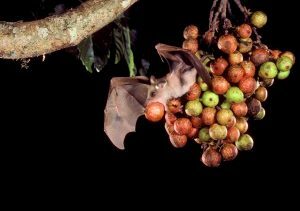 And, believe it or not, fruit-eating bats play a critical role in dealing with this issue! Bats are super effective in that they widely disperse seeds to degraded, deforested areas. The bat world is exceptionally diverse and abundant, with a variety of canopy and understory feeding habits. Their ability to fly (and quickly!) allows them to cover large distances during their nightly foraging flights, allowing them to reach deforested and degraded areas of the forest more easily than any human. Some German scientists have done related research, further reiterating the fact that bats are crucial to reforestation efforts. In one study, artificial bat roosts were installed in some deforested areas to attract more bats to the region. Evidence from the study showed that that there were, in fact, significant increases in seed dispersal over this wide range of sparse forest! Bats are a fantastic and natural way to help us speed up forest regeneration. There are many bat species in Osa. 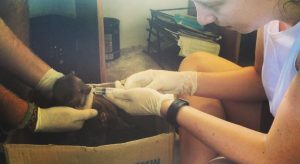 According to the research done by Doris Audet at Osa Conservation’s Piro BioStation, 33 species of bats from six families have been identified over the course of 32 nights of sampling. Phyllostomidae (leaf-nosed bats) were the predominant family in the captures. The presence of a diverse bat population in Osa Conservation’s old growth properties demonstrates that the forest is strong and healthy. Additionally, their presence will be a huge aid in the regeneration of some of the previously degenerated areas. Bats are potentially some of the most overlooked and forgotten about creatures of the forest, yet they play a huge role. Not only do they keep pest populations low, but they also pollinate our plants and help restore the forest. Understanding their role in both the ecosystem and the human world is crucial to their conservation and continued success and appreciation. Thank you bats!! Relationships Are Tough: Orchid Bees and Orchids. Have you ever seen the Exaerete, the bright green bee as long as your finger? 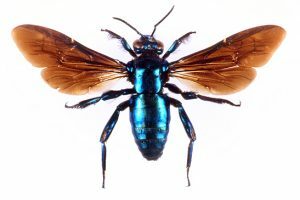 What about the Euglossa, known for it’s metallic blue, green, or red body? These insects and many others like them aren’t just any bees—they’re Orchid Bees. The Euglossini (the umbrella term for Orchid Bees) are some of the most important pollinator insects of the Neotropics, known for their unique coloring, size, and even shape. Their bodies can be partially metallic or covered in brown or black hair. 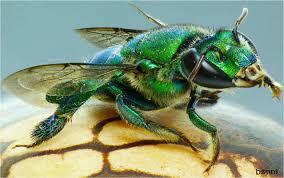 From Mexico to Argentina (and Florida where they were accidentally introduced), Orchid Bees rule the bug world. Euglossini collect nectar, pollen, and resin from plants just like any other bees, with an added special trait—they collect “odoriferous compounds”! What, you may ask, is an odoriferous compound? Well, it’s just a fancy way of saying that Orchid Bees collect fragrances from very specific species of orchid. Each species of Orchid bee has a fragrance preference and each orchid has a specific fragrance. Ultimately, this means that specific species of Orchid bees are attracted to specific species of Orchid! Not only does the Euglossini collect the fragrances, but it also uses them for courtship purposes. In other words, the male Euglossini has evolved to be extraordinarily picky in the smells that it collects and uses to attract a female to mate with. 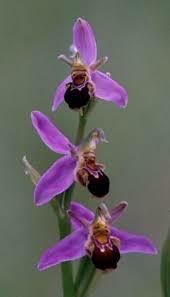 Additionally, because the orchids are pollinated as the bee collects the fragrance, some orchid species are more likely to be pollinated than others. Unfortunately for all you Orchid enthusiasts, this is potentially bad news. Orchids have evolved to specifically cater to an Orchid Bee’s preferences, meaning that many orchids can only be pollinated by one or two species of Orchid Bee! Additionally, estimates say that the survival of around 700 species of orchid (equivalent to 10% of the Neotropical Orchidae) is dependent solely on the existence of these insects! Yep, you heard me—no orchid bees means no orchids. Think twice the next time you have the urge to swat a bee! Despite this risk, orchids are relatively self-sufficient and have some amazing (and creative) adaptations to ensure pollination. Enticing bees with scents of vanilla, cinnamon, and even rotting meat is just the beginning. As a bee crawls into the flower of an orchid to collect the perfume, the orchids actually glue packets of pollen (called pollinaria) onto the bees in places where the packets will not easily rub off. Now, the pollinaria will pollinate the next flower of the same species that the orchid bee visits. In this way, the bee’s pollination is more efficient and more orchids are pollinated! This relationship is often described as asymmetric mutualism, which means that both species benefit from each other without completely relying on the symbiotic partner for survival. Even though some relationships between Orchid Bee and orchid rely more on each other, for the most part there are multiple pollinators for every orchid and additionally multiple orchids for every Orchid Bee. This asymmetric relationship isn’t just mutually beneficial, but it actually has really influenced the evolution of the orchid bee, allowing a male Euglossini’s preferred fragrance mixture to evolve rapidly when there is a disturbance to the system, such as an environmental disturbance, allowing both the bee and orchid populations to be resilient. The relationship between Bee and orchid attests to the power of nature to overcome challenges and evolution as nature’s problem-solver. When I left England on a cold, dark morning in June I had absolutely no idea what to expect when I touched down in Costa Rica. I knew there was rainforest, but I didn’t really know what that was, and I knew I was going to do sea turtle conservation, but I had never done anything like it before. Now, back in England and reminiscing on my experience, I can say whole-heartedly that it was the best thing I have ever done. I spent one glorious month at Estaciόn Piro on the Osa Peninsula. The surrounding rainforest is one of the most awe-inspiring places I have ever been. I saw two nesting Olive Ridley turtles, Coatis, Agoutis, countless birds, reptiles and insects and even a juvenile Cayman! 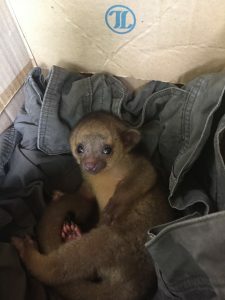 But there is a special place reserved in my heart for Fleur, the baby Kinkajou. 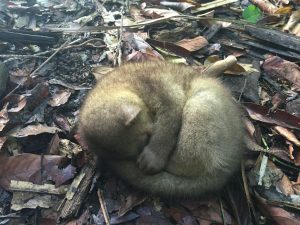 Charlie and I were walking back from a morning patrol on Pejeperro beach when we were stopped in our tracks by a tiny ball of fur curled up in the middle of the trail. At first we were startled, not knowing what it was, thinking it was going to run off at any moment, but she was completely oblivious to us. We checked to see if she was breathing, she was. We tried making a few little noises to see if she would get up and move away as we thought she might be hurt, but she would not be disturbed from her sleep. They are nocturnal after all! There was nothing Charlie and I could do for her on our own so we dragged ourselves away and headed back to base for a well-earned breakfast. We returned a few hours later with Manuel, the animal whisperer, to rescue her if she was still there. It was about 10 am so the chances of her mother coming back in the midday heat were next to none and the chances of her dying of dehydration, exposure or getting eaten by a bird, cat, or even ants, were very high. So we scooped her up and took her back to the station. 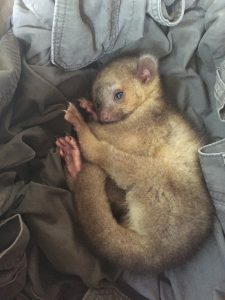 Kinkajous have a long tongue so they can feed off the nectar in plants. We started by trying to feed her a little sugary water but that didn’t go down too well so we gave her goats’ milk instead, which she liked. She was very relaxed and animated. She stretched out and scratched her belly. They have the most amazing hands and feet, like humans but with big claws for gripping the branches. And she chewed her tail, like a child when it’s teething. I think she was too young to know fear because she was not nervous around us at all. 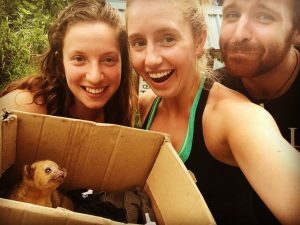 Our plan was to take her to a sanctuary that afternoon but alas the unpredictability of life in the jungle was no different that day so we nursed her overnight. She was so little and it was a cool and very wet night, so I got up to check on her and feed her twice. Once at midnight and again at about 3.30am when she started making a bit of a racket, a high pitched squeaking sound to be precise. We took her to the Sanctuary the next day. She was strong and healthy, a spunky little survivor, and I am confident that they will be able to rehabilitate her back into the wild. I had many amazing experiences in Costa Rica but I will treasure my time with Fleur the most.